Relationship Digest: Simple "Single" thoughts. Not being an expert on relationships (not actually sure what that is anyway), I do find myself, from time to time, trying to help friends and even strangers with advice about their relationships or lack of for that matter. Why is it that 100 people can give good advice to someone about a bad break up, a cheating partner or even how and what to do to find a decent partner, and yet, for the most part, seek this same advice themselves when their turn comes around? The funny thing is that they'll get that very same advice back to them that they may have given. I have been on a few forums for a long time and it seems to me that the same questions keep popping up about relationship problems. The same advice is given each time by the vast majority of members who, at some point, got that same advice. This has been my experience in real life situations as well. So it makes me wonder; are there clear and concrete guidelines for relationships? What are they and where can I find them? I probably do know many of them already, but, like a book, maybe they should be written down, if not already, and passed around as a standard for where to begin on our single or dating journey. I know that experiences and situations differ from person to person, but the "Meat" or "Core" so to speak, must be there. And I'm sure I'm not the first one to thing of this revelation. But think of it this way, if the info isn't out there, why isn't it? Also, if it is out there then we should all know where to go to get it. 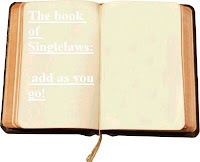 Dictionary.com to find a word, Poetry.com to find poems, Singleslaw.com to find the time tested advice in which to have a starting point? Ok, enough of my "Single" thoughts for now, but if you have an opinion about this, I'd really love to hear it! I think the reason we keep going around and around in circles, playing "advice tag team" with each other, is because we don't have the objectivity to analyze our own situations. When emotions get involved, logic sometimes flies out the window. The desire to hold onto love and keep the relationship intact is a powerful motivator that sometimes blinds us to unpleasant facts such as that we're being used, cheated on, lied to, etc. Heck of a good answer Elsie, I tend to agree. Even with the phrase I use in many situations with friends, "Who knows you better than yourself", in this case, it might be someone else hehe. That relationship book might be coming to a book store near you lol.